Partially Enhanced Sketch of Adelphi theatre, c1830. Frederick Yates made some changes around 1829. The theatre was renamed the Adelphi Theatre Royal. The Doric columns of the portico had more attenuated shafts and were placed on square pedestals. 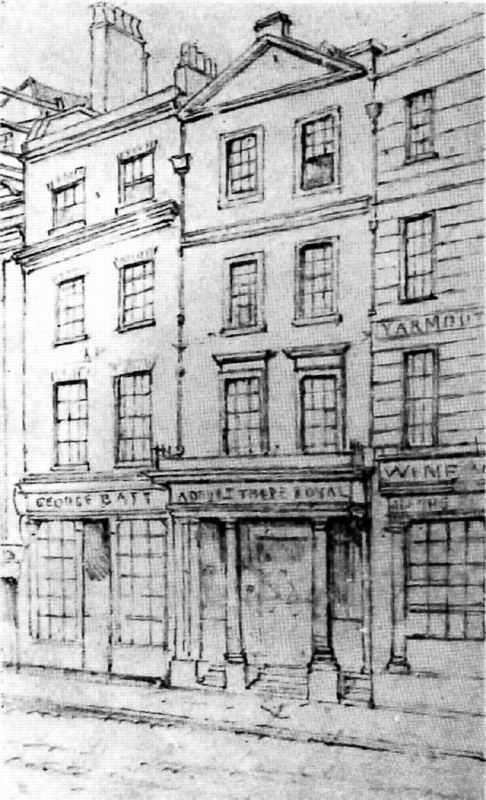 The drawing shows the front of the building, which is four stories high, stucco-faced, and is only two windows wide. On the roof is a triangular Greek pediment. The strange garden has disappeared from the roof of the portico. In an attempt to make the image easier to see, it was enhanced using Denoise [Block PCA] feature of the G’MIC (GREYC's Magic for Image Computing) plugin for Gimp (GNU Image Manipulation Program). Jérôme Boulanger is the author of the feature.